Thin Tab 3G Weight Loss Accelerator is a weight loss supplement that promises to provide “the sleek, slim look you want” and if the sales pitch is to be believed there’s never been a more effective formulation for burning fat and accelerating weight loss. It all sounds great, and the official Thin Tab website is equally impressive, but does the product’s potential live up to the hype? Closer inspection suggests that it may not. 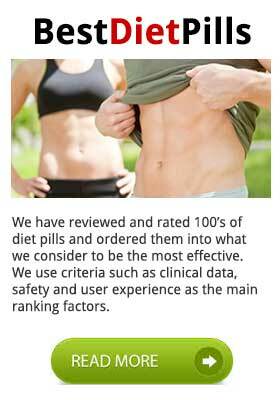 According to the supplier’s website Thin Tab has been providing safe and effective weight loss formulations for over 20 years, but the site fails to disclose anything about the company or where they are located. The only means of contacting them is via an online form. A little online digging reveals the Sim Tab 3G website’s domain was first registered on February 1, 1995. The Internet Archive Wayback Machine first cached the site in 1999 and that earlier version of the site bears contact information for a company based in Milwaukee, that appear to have been trading under the name of Health and Nutrition Supplements. Any further information about the company has proved impossible to find. Needless to say, none of this creates confidence in Slim Tab 3G. The official website does not provide any usage instruction. Two tablets are apparently considered to be a serving, but no mention is made of how many servings will be required each day. 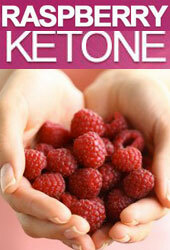 Helps to decrease the body’s ability to convert sugars and carbohydrates into fat. Helps control the appetite and reduce cravings. Increases the metabolism and helps burn more fat. Chromium Polynicotinate (10 mcg): A regular inclusion in slimming products, but it’s reputation for assisting weight loss is undeserved and the ingredient has been discredited by The National Union of Health. The blend also contains an inordinate amount of binders and fillers, but, in all fairness, the first three ingredients do have the potential to assist weight loss. 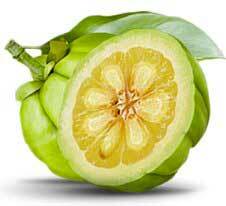 Garcinia cambogia contains hydroxycitric acid (HCA). This has the ability to prevent the liver from converting excess carbohydrate into fat. 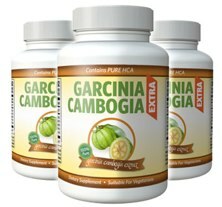 Garcinia cambogia can also suppress the appetite and numerous tests have shown it to be an effective fat burner. Green tea has a longstanding and enviable reputation for assisting fat burning, and the chlorogenic acid contained in green coffee beans is also a tested and proven fat burner. Good ingredients only work if they are included in sufficient quantity though. In this case the quantity is unknown. This product has been on the market for at least 15 years, but no customer feedback is available. This is odd. Nobody is saying anything bad about it, but nobody is saying anything good either and, in the absence of inclusion rates, some customer feedback could have provided a valuable insight into the possible benefits of the blend. If Thin Tab are aware of any side effects they have failed to disclose the fact, but several of the ingredients (green tea, green coffee bean, guarana) contain caffeine, so—once again—the lack of inclusion rates becomes an issue. 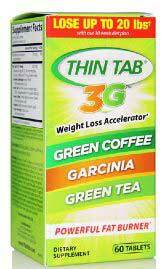 Thin Tab 3G Weight Loss Accelerator is not a recommended product. It never inspires confidence when a supplier of dietary aids fails to provide adequate information about who they are, where they are based, and what experience they have in the field of weight management and/or the manufacture and supply of weight loss supplements. Thin Tab state they have 20 years of experience, but do not provide any evidence to support this and their website domain has only been active for 15 years. Some of the ingredients used in the blend are admittedly very good, but that means nothing without the inclusion rates necessary for effective speculation on any possible benefits and/or side effects. Customer feedback cannot be found and the official site is high on promises and low on information. None of this gives Thin Tab 3G the edge it would need to stand out from the competition in what is already a very saturated market. Many better weight loss options are available. The product cannot be purchased directly from the supplier, but it is available to buy from the Amazon marketplace and can also be found on the shelves of most Walmart stores. The typical price for a bottle of 60 tablets is about $11.95; so the pricing is, at least, in its favor. Bulk buy options are unavailable though, and there does not appear to be a money back guarantee. The standout ingredients are Garcinia Cambogia, Green Tea and Green Coffee with preference given to Garcinia Gambogia. Garcinia Cambogia is arguably the most effective natural burner currently in existence with tremendous capabilities to not inly burn fat but to prevent the formation of new cells. This product gave me severe abdominal pain . I have given it a second chance and is exactly the same as the first time. It ends up with really bad headache pukeing eyes hurting and my body feeling are and weak I’ve only token 2 so far and it seems dangours for me. This product caused me ZERO stomach problems. It does EXACTLY what it’s supposed to do. Suppress your appetite. Don’t feel bloated taking it. Don’t use the restroom anymore than usual, don’t feel sick. It suppresses my appetite. I have nearly went through the bottle and I will buy another. I started with 1/2 and then worked my way up to about 3/4ths I take 3/4 with breakfast and then 1/4 with lunch. Works great for me. No shakes. No jitteriness. Sometimes if I haven’t eaten enough I will get a head ache. Not sure that’s even related to the thin tab at all.